To a generation of contemporary jazz guitar aficionados, Mike Stern is regarded as one of the true guitar greats of his generation. A player of remarkable facility whose searing lines are informed mainly by bebop and the blues while also carrying a rock-tinged intensity. Stern made his mark with Miles Davis in the early ‘80s before launching his solo career in 1985. Since then he has released 17 recordings as a leader, six of which were nominated for GRAMMY® Awards. His latest album is Trip. He has also played with Blood, Sweat & Tears, Jaco Pastorius, Michael and Randy Brecker, Eric Johnson, Bela Fleck, and numerous other major jazz musicians. Stern was presented with Guitar Player magazine’s Certified Legend Award in 2012. 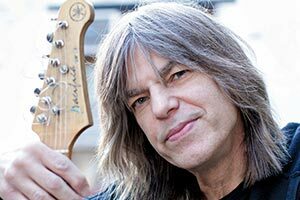 Ramapo College is thrilled and honored to have Mike Stern headline the 2018 Les Paul Festival Concert.